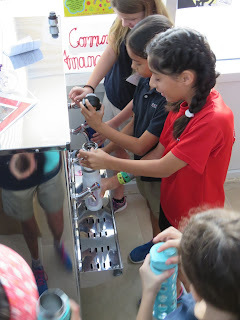 ASD Service Learning: Tackling Waste... One Re-usable Container at a Time. Tackling Waste... One Re-usable Container at a Time. The ES Roots & Shoots Club has been working away. A small but diligent group they have been involved in the change of behaviors and culture at ASD. How does one do that? Emboldened by last year's K1 service learning project that led to the elimination of plastic utensils in the ES cafeteria, the Roots & Shoots club wanted to address single-use cups. 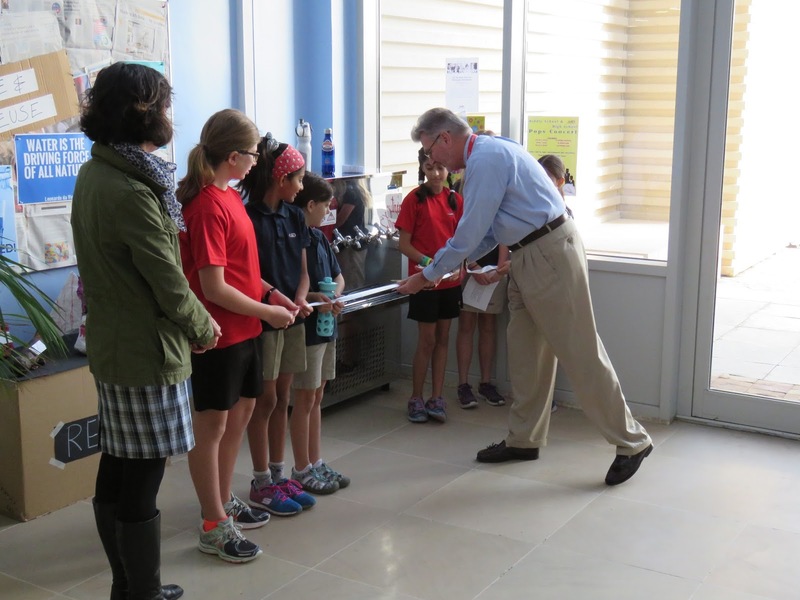 Working in conjunction with the school's administration the final product - water dispensers in seven locations around the ES - was kicked off this morning! Today dawned a new day, both literally and figuratively, for our ES. 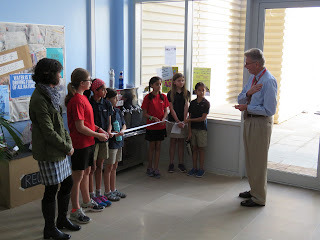 This morning the Roots & Shoots students were the focus of a small, yet very meaningful, "ribbon cutting ceremony" that served as the opening act of a new era. 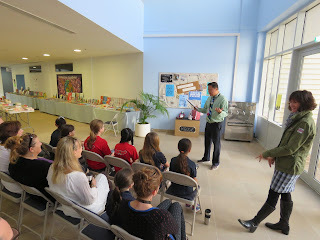 Short speeches by Mr. Advento (ES Principal), Ms. Griffith (Roots & Shoots advisor) were a preface to the grand opening. 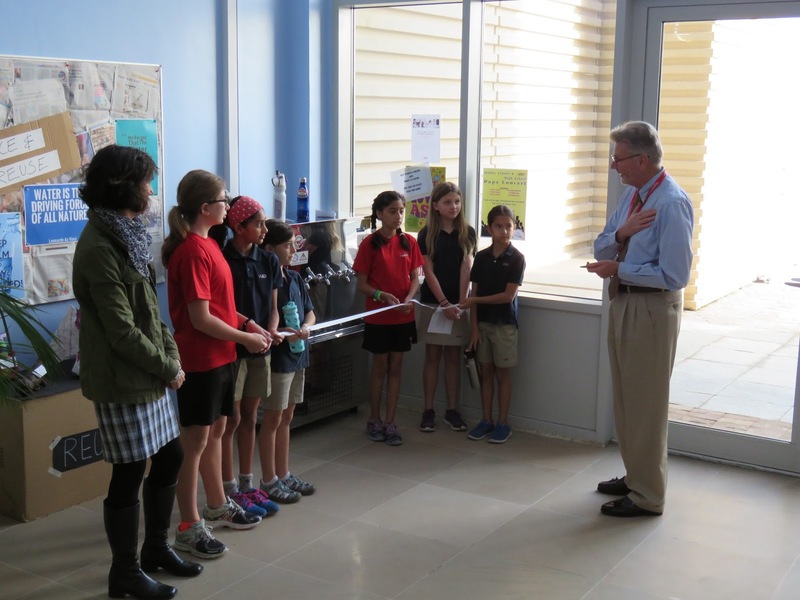 Dr. Mutch also addressed the necessity for change makers before cutting the ribbon. 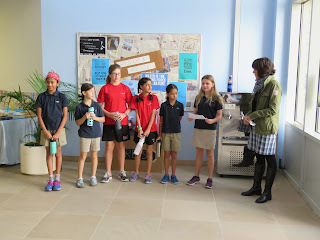 Finally, the members of the Roots & Shoots club participated in a "first water bottle filling" to signify a key shift in the way ASD provides water to its community. What can we expect moving forward? Along with the elimination of the water bottle vending machines back in December, the introduction of the water dispensers forms a bold step in the "war on waste" (as they are calling it at the Sustainability Action Team meetings) for our school. As time ticks on, armed with our water bottles and reusable mugs, we expect to see our students being examples of sustainable practices and role models in their own right.